More explanations are given in this document . It is a web form that you fill with your data and values for the program options, your name; then click on the "Execute & email results" button to start the program with your settings; after a while you will receive your results by email. The input source tree file contains source trees encoded in standard Newick format, possibly containing edge lengths and bootstrap values. You have the possibility to input a starting backbone tree in which missing taxa of the source trees are inserted. This file contains the backbone tree you proposed. This backbone tree is possibly simplified if not satisfying the PC property. When PhySIC_IST is provided with unrooted source trees, it first has to root them. To that purpose, the software incorporates a rooting tool that automates the procedure. This tool accepts as input different outgroup levels, specified in the outgroup file. Each level is a list of comma-separated taxa. Each level of outgroup must be divided from the next one by a line break. The rooting procedure considers each unrooted source tree separately. 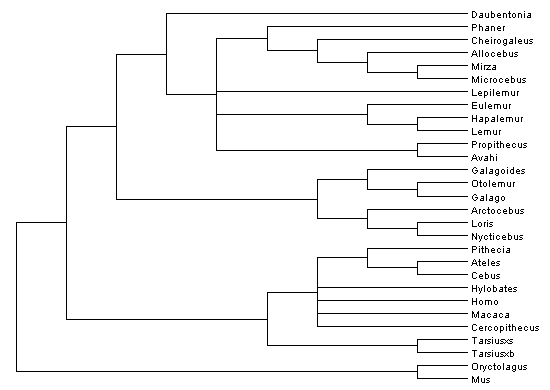 For a given source tree T, it determines the first level of outgroup that contains one or more taxa of T. Then the tree is rooted on the branch leading to the smallest subtree hosting all outgroup taxa of this level present in the tree. In other words, unrooted source trees are rooted on the branch leading to the outgroup that is the farthest from the ingroup. If the proposed outgroup is not monophyletic, the tree T is discarded from the analysis. This procedure does not alter the resolution inside the ingroup nor in the different outgroup levels that can be present in the tree. 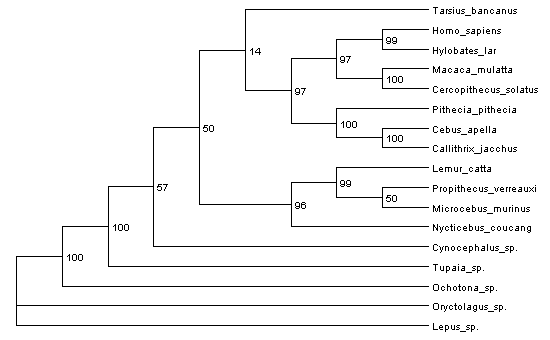 is discarded from the analysis because none of the outgroups taxa are present in the tree. is discarded from the analysis because the outgroup (Dasypus, Echinops) is not monophyletic. The correction threshold is the threshold used by the STC (Source Tree Correction) preprocess, aiming to detect anomalies in the source trees (e.g., resulting from paralogy, HGT events or long branch attraction). The STC preprocess detects incongruences in the source trees on the basis of triplets of taxa present in the source trees. When conflicting resolutions are observed among source trees for the same three taxa, STC drops the resolutions that are statistically less supported. This is achieved by a Chi-Square test comparing the frequencies with which the conflicting resolutions respectively appear. The correction threshold is a real value between 0 and 1. The higher it is, the larger the difference between frequencies of conflicting resolutions has to be in order for STC to drop the least frequent alternatives. In other words, setting the correction threshold to 1 impedes STC to drop any input triplet, hence leaves the source trees as they are, while setting it to 0 implies removing from the source trees any contradicted triplet (e.g. ab|c) that is globally less frequent that an alternative resolution (e.g. ac|b). In the former case, PhySIC_IST behaves as a pure veto method, while in the latter case it mimics a voting (i.e., liberal) supertree method. When STC drops some triplets, the source trees are modified in order that those triplets are not displayed anymore. The supertree inferred by PhySIC_IST is outputted in Newick format. It can be visualized with usual tree viewing/editing softwares such as TreeDyn, Treeview X or DendroScope. PhySIC_IST also outputs the list of input taxa not inserted in the supertree (if any) and the value of the CIC for the proposed supertree. The CIC value measures the informativeness of the supertree (see the paper for details). PhySIC_IST also outputs a "newForest" file. This file will contain the modified source trees.